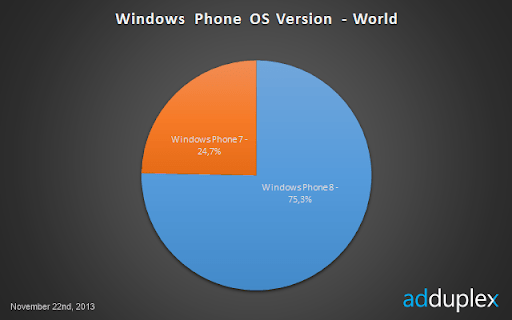 It’s time for another Windows Phone statistics report. Did Lumia 1520 make a splash in just one day on the market? 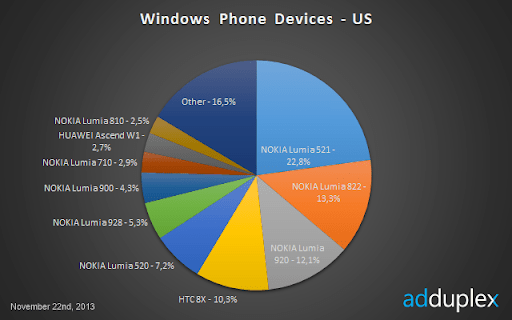 Which phones are the most popular in top Windows Phone markets? Read on to find out. This report is based on data collected from 2,087 Windows Phone apps running AdDuplex SDK v.2. The raw data analyzed was collected over the day of November 22nd, 2013 (UTC time) unless otherwise stated. We have made every attempt to consolidate different reported phone model names under their canonical retail model names, but it is possible that some of the rare model name variations were not accounted for. 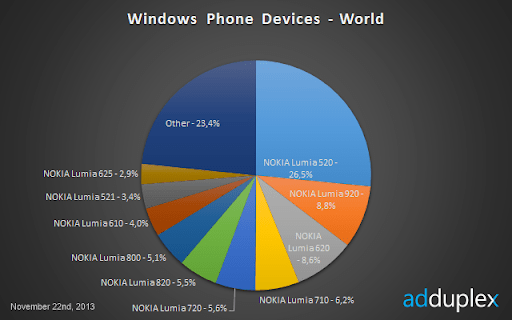 Lumia 520 continues to grow worldwide and added another 3.3% to its share. It is also interesting to note that venerable flagship Lumia 800 has slipped 2 places down and is now outnumbered by Lumia 820 and 720. And finally we see Lumia 625 and 521 (which could be added to 520’s share) entering the worldwide Top 10. Over the weekend we have posted on Twitter that Lumia 1520 occupies nineteenth position in the WP8 chart and that was interpreted by media as a sign of great success. It is important to note though, that there are only 21 Windows Phone 8 device out there (according to what we know) and L1520 is only above Samsung ATIV S Neo and Huawei W2 (both new and with limited availability). So it’s too early to declare Lumia 1520 commercial success. We will see next month. 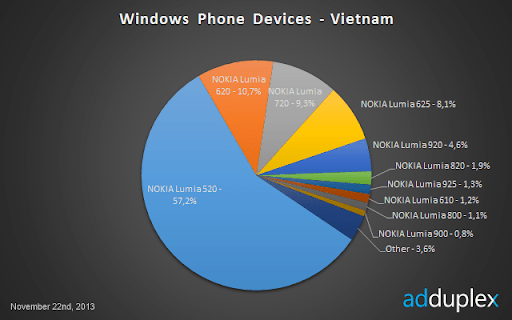 It’s undeniable that Nokia “owns” Windows Phone device market and it have reached a new milestone this month. 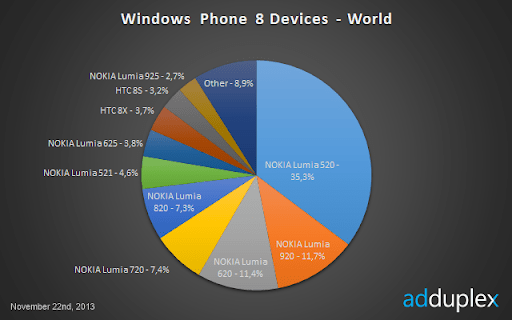 9 out of 10 Windows Phone 8 devices in use are made by Nokia. The OS itself has reached a milestone too. 3 out of 4 Windows Phones out there run Windows Phone 8 now. In US there are less than 15% users still on WP7. Lumia 521 is a breakaway hit again and Lumia 520 has grown too. So, if we combine these two, the situation is pretty close to what we see worldwide. The growth of L52x is happening at the expense of Verizon which has lost more than 3% of WP8 market in US and doesn’t have a cheap Lumia on its roaster. Latest reports from Kantar and IDC have identified some countries where Windows Phone is doing pretty well and we decided to take a look at these countries to see which devices are responsible for that growth. Two notable changes here are Lumia 520 growth (no surprises) – almost +8% in 2 months, and Lumia 625 entering the Top 10. 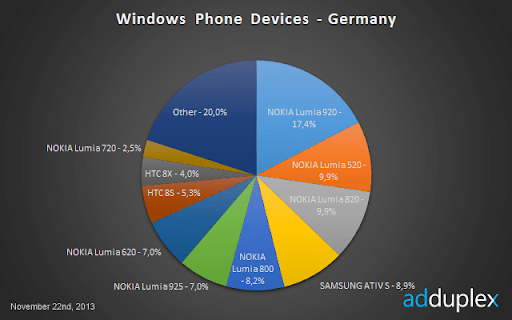 Germany’s pie looks like a healthiest view of the Windows Phone ecosystem. We see higher end Lumia 920 at the top, with other higher-end devices in the top 10 – meaning theoretically higher purchasing power of the users. We also see pretty healthy numbers for phones made by both Samsung and HTC. France was a land of HTC 8S not so long ago, but those days are long gone. 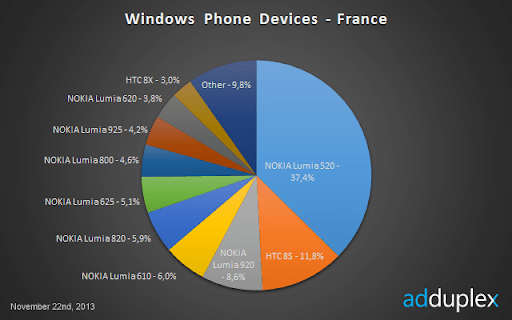 Lumia 520 has a massive 37.4% share in France (almost 5% growth from just a month ago). Lumia 625 made a strong entry into the top 10 with 5.1%. Italy was one of the few countries where WP7 did pretty well and it’s interesting to see if that transitions into success for WP8. 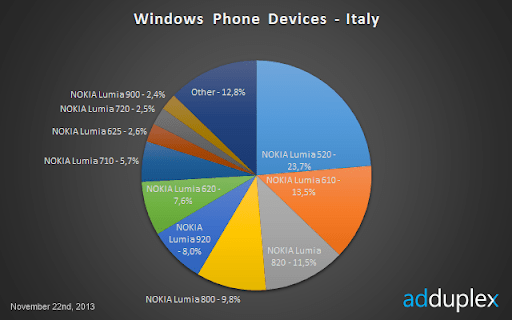 Looks like Lumia 520 is doing its job pretty well in Italy. Also there are now more WP8 devices in the top 10 than there are WP7s. 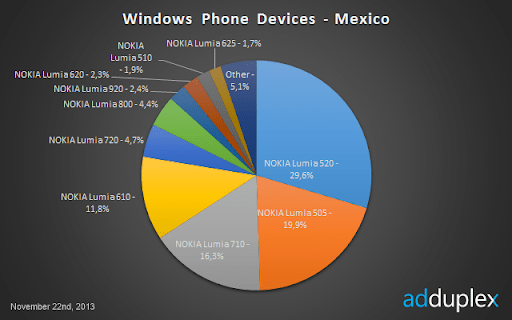 Another big Windows Phone country is Mexico. 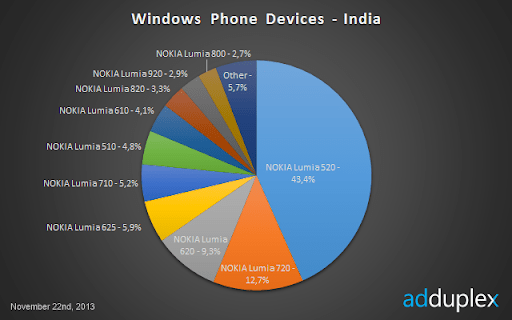 While Lumia 520 is doing spectacularly there, it is followed by 3 Windows Phone 7 devices which together make up almost half of all the Windows Phones in the country. 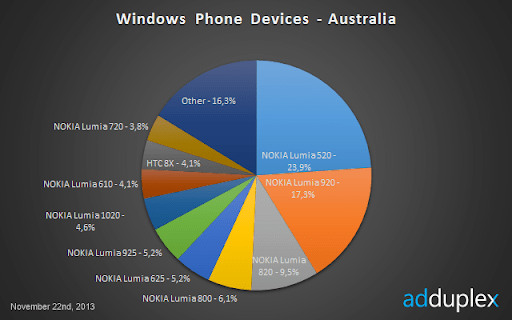 Australia was another country in the reports where Windows Phone made notable market share gains. 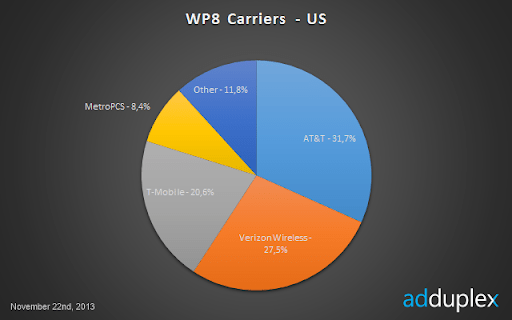 And we can see that top 3 devices are running WP8 and together account for more than half of all Windows Phones in the country. It is also one of the few countries where Lumia 1020 registers in the top 10 and far from the last spot with 4.6%. We continue to cover India every month, even though it’s getting less interesting lately. The only change worth mentioning is Lumia 625 jumping from #8 to #4 with 5.9%. And the last country in this report is Vietnam. It was reported as one of the bigger Windows Phone countries and we can also see it on our side. 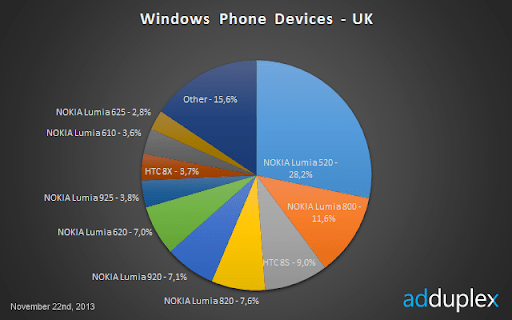 What we also see that the share of Lumia 520 is just massive there. 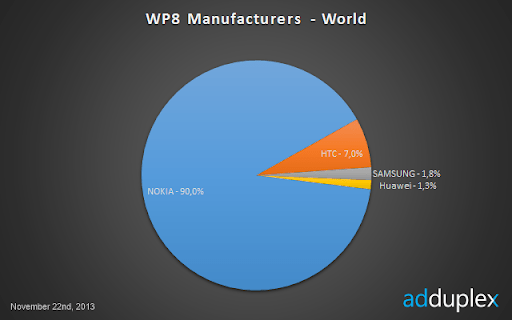 It’s all Nokias in the top 10 and most of them are running WP8. AdDuplex is the largest cross-promotion network for Windows Phone and Windows 8 apps empowering developers and publishers to promote their apps for free by helping each other. AdDuplex was established in January 2011 in Vilnius, Lithuania. As of November 2013, more than 5,000 apps actively use AdDuplex to gain more visibility.